Locksmith Southampton offer master key systems that include euro cylinders, oval cylinders, rim cylinders, padlocks and cam locks. Imagine 200 houses in Southampton, 1500 rooms and just ONE KEY for the landlord! Sub master keys and service keys for maintenance personnel to grant access to the areas they need without access to customers or private rooms or areas! Our Locksmiths possesses a wealth of experience of implementing high security secure master key systems into commercial premises. The benefit of a masterkey system is that one key can open every lock in the system, whilst others will have limited access. We have supplied and fitted Master key systems for Schools, Hospital’s, Colleges, University’s, Hotels, and Offices, Apartment blocks, Factories and even private homes. Protected Section Master Keys – new keys can be cut where the originals were purchased, with documentation. Keys for systems such as those detailed above can, more often than not, be supplied while you wait or on a same-day basis, providing that proof of proper authority can be displayed, where applicable. 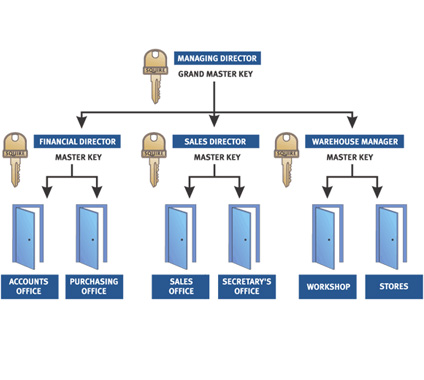 Many people choose to buy master key systems from architectural ironmongers or even online. While the low cost of these systems can be attractive, customers find the aftercare to be poor. Keys are often required in a hurry and when systems are not bought from locksmiths they can take weeks to be cut and delivered. The benefit of having a master key system with a local locksmith such as ACQ is that we carry blanks for all the systems we sell and keys can be cut while you wait. Also locks that are in need of repair can be dealt with by our staff on site, and in many cases can be ready the next day. We can also build new locks for your system as required. If you are seeking a Master Key System in Southampton, require an expansion of your existing system or simply require new keys, contact us for a speedy, efficient and cost-effective level of service – we pride ourselves on exceeding the expectations of our customers.